So I hear, these days... as you progress up the corporate ladder it's suave, sophisticated and debonair to ask the pantryman to get you " Green Tea " whilst your slaves ask for " Coffee " "Tea" and a few who want to be cooler than the Master call for " Black Tea" ... You don't believe me?? Enter a corporate boardroom and see it for yourself. 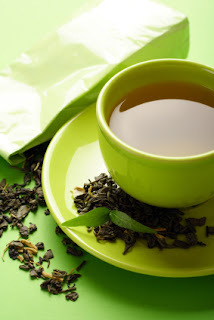 Let's leave the Coffee, Tea and Black Tea aside for some time and focus here on Green Tea. So I wonder if Green tea is so beneficial for fat loss as people believe it to be, why 8 out of these 10 masters who call for Green Tea are the ones who have balloons for bellies, a natural Smokey eyes make up that we see on models.. perhaps that reflects their diet and lifestyle... So is Green Tea really helping them to lose weight?? Is Green Tea really helping you?? If not , why the big hoopla about it? Let's understand Green tea once and for all today! Whether it benefits you. If yes, How?
" 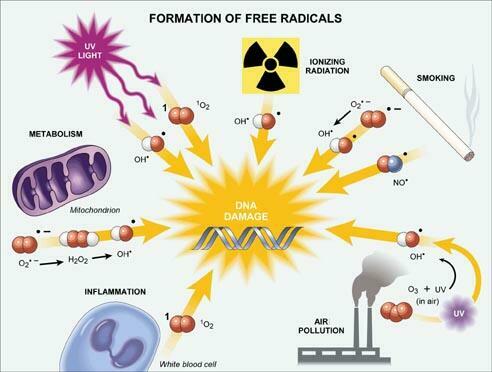 Free Radicals!! " You must have heard people throwing this term at you while sipping on green tea, and provide radical answers , when asked what exactly these radicals are and how they relate to Green tea..
Free radicals are atoms or groups of atoms with an odd (unpaired) number of electrons and can be formed when oxygen interacts with certain molecules.These free radicals occur naturally in the body,however air pollution, Smoking, UV Rays of the sun, chemicals from food, unhealthy processed food, and a lot of other things we put into our bodies also give rise to these damaging particles. Once formed these highly reactive radicals can start a chain reaction. They turn extremely dangerous when they react with components like DNA and tamper or modify cells. They may even cause cell death. To prevent free radical damage the body has a defense system of Antioxidants ( here's where GREEN TEA comes in). Antioxidants are substances that destroy these free radicals. Why is Green Tea beneficial? Along with the above mentioned benefits it has numerous other benefits. How many cups of green tea will allow you to reap its benefits? 1? No... 2? No... 3? May be.. 4? May be... 5? Now we're talking... 6? 7? Better... 8?? 9?? 10?? Best!! There's a lot of conflicting research on How much Green Tea one must consume to benefit from the antioxidants it provides. 1 cup of Green Tea = approx 200 ml with 1 tea bag = approx. 90 mg of Polyphenols. To start benefiting from Polyphenols , research suggests consuming a MINIMUM of 3 cups a day... and the more the better. To get Significant benefits from Green Tea one must aim to consume atleast 5 cups a day and again... the more the better. Some research also suggests significant benefits only by consuming 8 -10 cups a day. I say, with all the research that ranges from 3 to 10 cups , lets stick to at least 3 cups a day. Yes, 3 - 5 cups of green tea a day , in my opinion, should be enough to reap significant benefits from it. How to make the Green Tea? It is believed that exposing green tea to boiling water can affect the polyphenols. Hence it is best to not put the tea bag in boiling water or pour boiling water onto the green tea bag. Side effects of Green Tea? Green Tea also contains Caffeine. Though less when compared to a cup of coffee , which may contain about 120 mg of caffeine. a cup of green tea may contain about 30-60 mg of caffeine (depending on the variety). . So if caffeine keeps you awake , it may not be a good idea to consume green tea in the evening. Apart from the effects of caffeine it contains, there are no known harmful side effects of Green tea. So enjoy your cup of green tea a day ( at least 3 and the more the better for maximum benefits), however remember that it is only a supplement and not a substitute for a healthy diet and a dose of regular exercise to keep yourself fit. Fruit Juice bad for you?.. of Juices, Sugars and Livers.. 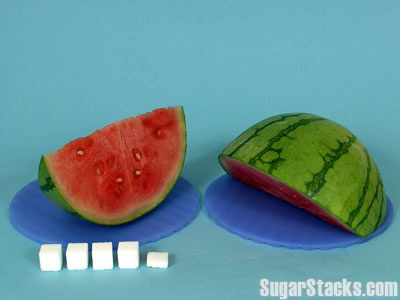 Fruits contain: Fructose + Sucrose. There's a reason why Fructose is in bold. Some fruits contain more Fructose than Glucose and vice versa.More on this in the upcoming posts.. for now let's stick to whether or not juices are bad for you. To make one glass of orange juice you take at least 4 oranges, 6 if they're very small. Then you squeeze the juice out of it and throw away the fibrous part of it. 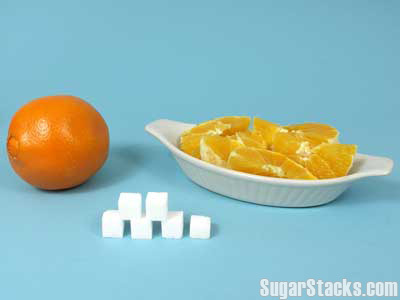 So, one orange contains approximately 15 gms of sugar. 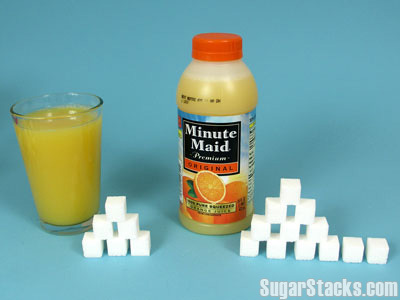 So now your glass of juice contains 15 x 5 = 75 gms of sugars!!! WOOAAHH!! No wonder it tastes so sweet and leaves you craving for more if you don't have a large glass of it! Shocked?? you've got all reason to be... Not only that , you are not even consuming the roughage / fiber from those 5 oranges. We all know the benefits of fiber and this deserves one full post in the future... for now... ya.. the juice..
Glucose can be metabolized by every cell in the body and is distributed directly into the blood. When glucose enters the blood stream, the body releases insulin to regulate it.. whereas Fructose can be metabolized only in the liver... 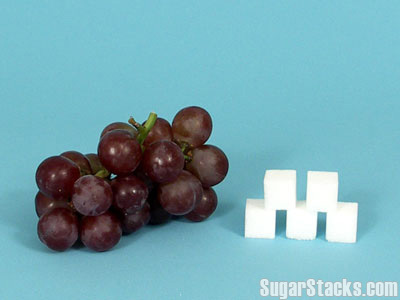 The liver cannot process large amounts of fructose quickly and results in it being stored as fat. Bloating, excessive flatulence, loose stools, and even diarrhea depending on the amounts consumed and other factors. For people with celiac disease, irritable bowel syndrome, or other fructose absorption issues, fructose malabsorption may be a major health concern. "When fructose reaches the liver," says Dr. William J. Whelan, a biochemist at the University of Miami School of Medicine, "the liver goes bananas and stops everything else to metabolize the fructose." Eating fructose instead of glucose results in lower circulating insulin and leptin levels, and higher ghrelin levels after the meal.Since leptin and insulin decrease appetite and ghrelin increases appetite, some researchers suspect that eating large amounts of fructose increases the likelihood of weight gain. 2 cubes of Sugar in your tea don't seem so bad anymore, do they?? There!! We've solved the conundrum of whether or not fruit juice is bad for your body!! 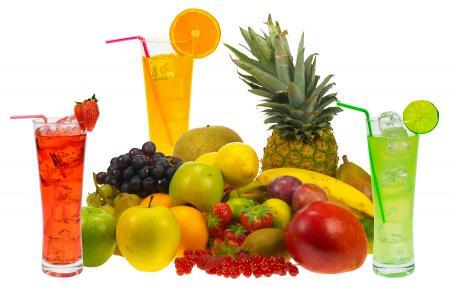 I've always recommended everybody around me to have Whole fruit than fruit juice , because of its numerous advantages as compared to concentrated juice from 10-12 of the same fruit. Having said that, we all love fruit juice....Because it's SWEEEETTT!!!! that's because Fructose is the SWEETEST OF ALL NATURALLY OCCURRING CARBOHYDRATES. 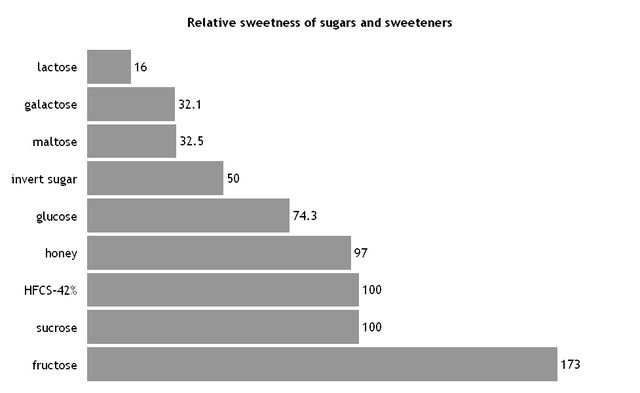 (Relative sweetness of 173 as compared to Sucrose at 100).... So... even I enjoy a glass of fruit juice (once a month) .. we all love it.. Cheers to that I say!! You must be aware of this feeling: out on the streets in the afternoon heat...your throat is dry... your body and skin feels dehydrated...you are thirsty to the bone... and there appears a big fridge filled with Pepsi..Thumbs up .. Mirinda.. Nimboos.. Real Juice.. Chaas.. Energeee and what not... and all it takes to get a chilled bottle of pepsi in ur hands in 10 seconds is, " Boss ek pepsi dena..".... and right next to the shop u might find a humble ( at times old , but robust and strong) South Indian sitting next to his bunch of 100 coconuts and a big basket full of empty coconut shells. Coconut water costs 25 Rs for 200 ml , whereas Pepsi costs 24 Rs for 500ml + 100 ml FREE!! I'll tell you why that one minute is worth the wait and why those 25 Rs spent on 200-300 ml of coconut water gives you the Biggest Bang for your Buck!!! I wonder if Nariyal paani and Noelani have any connection... anyways, coming back to the point. The very rightly call it so because of its numerous benefits. To start with,Mr. Morton Satin, Chief of FAO’s Agricultural Industries and Post Harvest Management Service says "It’s a natural isotonic beverage with the same level of electrolytic balance as we have in our blood. It’s the fluid of life, so to speak,"
Coconut water has saved a lot of lives in underdeveloped countries.In cases of severe diarrhea and vomiting , Coconut water's unique properties rehydrate the body to make it fit enough to fight the infection. Death rates from cholera are high, but with the use of coconut water survival rates increase to 97 percent. Coconut water contains Plant Growth Hormones, Cytokinins. Coconut water is the richest source of dietary cytokinins. Cytokinins are also known as anti-aging hormones.Cytokinins regulate cell division and influence the rate at which plants age. In humans, they have a positive influence on cells and tissues. When cytokinins are applied to the skin, the result is that on the surface of the skin, wrinkles tend to flatten out and dry, aging skin is replaced with smoother, softer skin. Now, Ladies, you know what to apply on your body for a younger looking skin. So now you know why waiting a minute for the humble South Indian guy to reach the coconut shell and give you the fluid of life is worth the wait and gives you the most bang for your buck!! 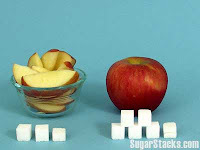 Sugar Substitutes: Killing you.. Making you Fat and even causing Diabetes! Walking in those shoes is not going to harm you, but unfortunately the same dusky beauty, knowingly or knowingly, is endorsing Sugar Free / Artificial Sweeteners that can harm you and actually make you Fat! !or even worse.. Kill You!! To know more about side effects of Aspartame you may refer to the following Document listing Symptoms Attributed to Aspartame in complaints submitted to the FDA or visit http://www.holisticmed.com/aspartame/ or you may read The straight talk about Aspartame or simply google "Aspartame" and take a call. However, as a fitness expert i will focus only on "What happens when you consume Sugar Free, Nutra sweet etc"
Here I'd like to refer a study done by Scientists at Purdue University in West Lafayette, Indiana that links Artificial Sweeteners to weight gain. I will stick to this Purdue research, as a reason to avoid artificial sweeteners because we have concrete evidence for this link, apart from a lot of other disputable evidence that proves Aspartame/artificial sweeteners to be the reason for Cancer,tumors, headaches, rashes, chest pain, dizziness etc. ( Yes.. 92 of them) even by the World Natural Health Organization website!! ( Again , I leave it to your research and intelligence). But let's talk about this study that links artificial sweeteners to weight gain.Let me make it simple for you to understand , what it is that you gain weight in spite of using artificial sweeteners. 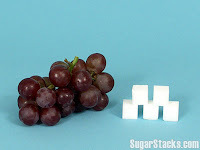 I'm sure you have a lot of people around you that religiously consume only artificial sweeteners but seem to get only Fatter and gain more weight year after year. ( I know you are picturing these people right now). Let's break it down. When you eat a medium sized banana , your body expects to get some solid substance in your mouth, few grams of fiber, few grams of carbohydrates, few grams of fats etc. to make a total of around 70-80 Calories.So, you eat the banana, body gets its nutrients, it is happy and wont crave more food for some time. Now imagine, if you were to simply put a drop of Banana Essence, that is used for flavoring ice creams or cereal, on your tongue.What happens then?? Now the body gets ready to process the 70-80 calories coming from the banana, but Where is the Banana??? There is no banana!! Only the essence, which fools the body and confuses it.. So after consuming the artificial sweetener, the body simply craves more food and will expend less energy!! Continuous consumption of artificial sweeteners degrades the body's ability to predict the number of calories consumed in a meal and may result in consumption of extra calories.This will result in gaining fat. Now the question comes, why haven't these artificial sweeteners been banned? My personal view is , for the same reason that cigarettes are not yet banned. As a fitness professional, I will never ever recommend Artificial Sweeteners to anybody and I suggest you do the same. Also, now that you are aware of the ill effects of Sugar Free, Nutra Sweet etc, please spread this as much as you can and save your loved ones from suffering that may come along with consumption of Artificial Sweeteners.